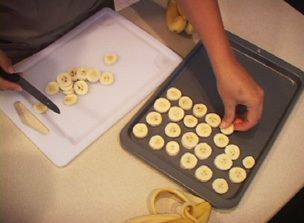 RecipeTips.com's video demonstration, 'How to Freeze Bananas,' describes the best way to freeze bananas for baking at a later date. Hi, everyone! 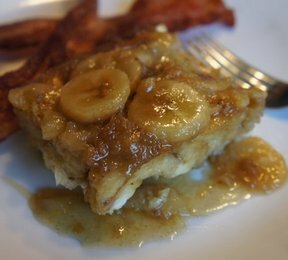 This is Laurie from RecipeTips.com, and today I am going to show you how to freeze bananas. There is a lot of different reasons to freeze bananas. One of them is to use in smoothies or just to have as snacks readily on hand. 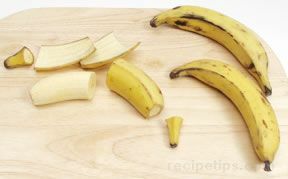 Go ahead and peel your bananas, and then you are just going to slice them into rings, place them on a cookie sheet, and pop them in the freezer a couple hours until they are frozen solid. 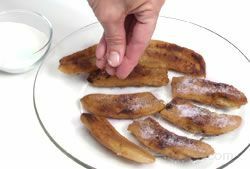 Once the banana slices have been frozen all the way through, just pop them into a resealable Ziplock bag, freezer bag, and throw them back in the freezer; then you can take out as many as you need whenever you need them. The next way to freeze bananas is to freeze bananas that are already ripened, bananas that you know you are not going to get to before they are too ripe to save. So, what you can do is you can go ahead and peel the bananas whole and throw them in a freezer bag, or you can take them as is with the peel on and place them in a zipper bag; then all you have to do is throw them in the freezer. 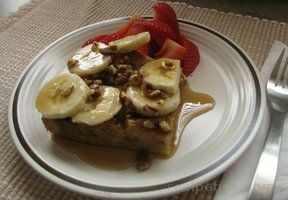 These are perfect to use when you want to make banana bars or banana bread. Make sure you get all of the air out of the bag before you seal it shut. They are ready for the freezer. 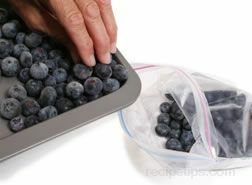 For more great tips on storing fruit, visit RecipeTips.com.